Following the conclusion of the final Pirelli World Challenge race of the season, K-PAX Racing has emerged the 2016 Team Champions with Driver Champion Alvaro Parente, earning McLaren GT the Manufacturer title. Heading into the weekend, the team held the lead in the Driver, Team, and Manufacturer championship, optimistic in their championship hopes. 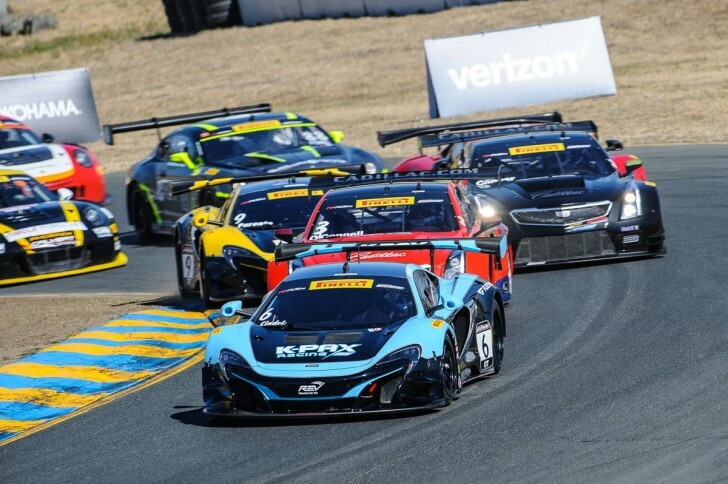 The McLarens proved to be competitive in qualifying, with Austin Cindric leading the team charge in fifth points leader Alvaro Parente in sixth, and Colin Thompson in seventh. Parente’s main championship threat, Patrick Long qualified second, adding to the tension for the race ahead. On the morning of race day, the team was thrown a curve ball. A last minute review of the points revealed Parente had been awarded the Lime Rock pole points belonging to Andrew Palmer, who was unable to start race two due to an accident in the morning warm up. Just hours before the race, K-PAX Racing was informed they held just two points over Patrick Long. In order to win, Parente had to finish ahead of Long. Motivated by the championship title Parente had a strong start, jumping from sixth to third as the team entered turn one. Pole sitter Johnny O’Connell led Long and Parente for the majority of the race, with several cautions never allowing the leaders to fully pull away. The field waited to go back to green with one lap remaining, giving Parente a final shot to pass Long. The green flag waved, and Long tried to make a move on O’Connell for the lead. The two had contact, sending Long off, allowing Parente to take the position to finish second. The result earned the driver, team, and manufacturer top honors after a highly successful season. The successful afternoon adds to K-PAX Racing’s strong history, now earning their fourth driver championship (2007, 2008, 2010 and 2016), and third manufacturer title (2008, 2010, 2016). Plans for the 2017 season will be announced at the later date. I am just so proud of our organization. This is an extremely tough Championship with so many good teams and drivers. To have it come down to the final race and the final lap shows just how hard we all fought. It has been an amazing season with the usual highs and lows of any race series. There are so many great people we work with from team members to our manufacturer McLaren GT and everyone in-between and to bring home not only the Driver Championship but the Team and Manufacturer Championships as well is icing on the cake. I am looking forward to enjoying the evening and then I am sure we will back to work shortly sorting our next season. IT was a great end to a very hard fought season. We had a lot of ups and downs, and a lot of setbacks, but Alvaro and the team persevered and hung in there until the last lap of the last race and got it by a close margin. We knew it would be tight, especially given the points change at the beginning of the day. The guys did what they had to do, and in the end, all the hard work paid off. Incredible. A stellar campaign all season by the whole K-PAX crew and factory driver Alvaro Parente, well deserving champions. It’s been a tough fight for them all year and their hard work paid off today. For McLaren GT to secure the Manufacturer’s title is the icing on the cake in what is an incredibly tough-contested championship. Well done to all. What a crazy day, and it started off with the points controversy. There was a lot of pressure this weekend, but I tried to keep it cool. I really had a good start, which was fundamental. It was one of my best starts of the year. Then I didn’t have the ultimate pace. I tried once or twice to move on Pat Long, but his pace was good too. Then I took advantage of the last lap, which was a bit crazy there. He and Johnny fought, I took advantage and passed him. It’s crazy how we did it in the last moment. We deserved it, and we should have gotten it earlier than this. We got it. Thanks to K-PAX Racing, Flying Lizard Motorsport, and McLaren GT. It’s been a pleasure to race in the Pirelli World Challenge this year. Unfortunately, we didn’t get off to a good start, and I got shuffled back a few spots. I tried to fight back from where I was. I worked my way back up to the pack. I had an incident on the last lap and fell back to 20th. We didn’t end the season on a high note like I thought we could have. The biggest plus from the weekend was the team, winning the team championship, the manufacturer championship, and the driver championship for Alvaro. Those were all three giant boxes to be checked, and it was really cool to be a part of that this year. They really stuck with it and worked hard all year to get where we were. About halfway through the season, our car really became a threat. Hopefully this leads to bigger things. I can’t thank the K-PAX Racing and Flying Lizard guys enough for all their hard work. Heading into the last race of the year, I had an awesome start. I gained a couple positions right off the bat going into turn one, and was able to get into the position to assist Alvaro with just one car between us. It paced out for a while into a train, with no one passing. A couple yellows happened, and the balance of the car started to change. It became more a challenge through the end of the race. I had a bit of a mistake that sent me four wheels off into turn six. I dropped a couple positions for a shootout in the last lap for everybody. It’s unfortunate we didn’t finish the race, but thanks to everybody at K-PAX Racing for all their hard work this year. The guys really hustled all year to give 110%, and I’m proud to be a part of it.